We are celebrating sweet 16 years of business in 2019! READY-TO-WEAR JEWELLERY & ACCESSORIES via made in Harmony. Visit us anytime in-store to CREATE YOUR OWN exciting beaded masterpiece! We pride ourselves in providing great customer service and after sales care. Should you have any questions or enquiries regarding our store or products, please contact us. We endeavour to make your shopping experience a pleasant and enjoyable one. 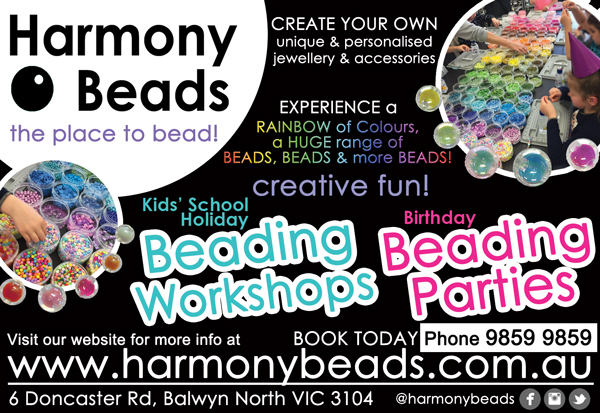 Thank you for visiting Harmony Beads - the place to BEAD! Exclusive Beaded Jewellery and accessories, Fashion and Bridal/Special Occasions Jewellery.